Welcome to The Blissful Blondie, I'm so happy you found my site. This is where my love of movement, fitness, mindfulness, Ayurveda, nutrition and self-care (with a bit of travel thrown in for fun) converge. I started my own massage business in 2011, and a wellness blog followed quickly. Over the years, my focus and offerings have grown and evolved massively, just as I have as a teacher and student. It's my desire to provide a resource for like-minded people and a way to form connections through our community. I hope you enjoy what you find here. "I believe in following your bliss. The things that shake you and move you beyond the depths of your bones. Bliss offers opportunity. It offers more light. It carves new, knowing roads. But I also bask in the shadow. I dive into the grit. I sit in the discomfort and I let go. I let go. I let go. I have lived in Austin for the past 7 years and have been to at least 15 different massage therapists over that time spam. All were pretty good, but nothing memorable. A friend referred me to Chris, and I seriously received the best massage of my life. Like most people, I sit at a desk all day, staring at my computer. Years of this has caused extreme tension in my shoulders and lower back. I can easily say she was able to relieve the knots in my back after a single session! Chris is one of the best massage therapists I’ve seen in Austin. She listens to my needs, and focuses her massage on areas I’ve mentioned are troubling me. She has strong hands and gives me an extremely firm and deep massage, when needed. Her massages are effective at loosening up tight muscles and tendons. Pilates is a system of over 500 exercises that engage the mind and condition the entire body. It is a balanced blend of strength and flexibility training , that improves posture, reduces stress and creates long, lean muscles. Pilates works the entire body through smooth, continuous motion, with a particular emphasis on the intrinsic core support of breath for the body's "powerhouse" - abdomen, back and pelvic girdle region. Pilates is distinct from most fitness regimes because it's low impact and addresses the body as whole. Pilates takes a balanced approach so that no muscles group is overworked and the body works as an efficient, holistic system in sport and daily activity. The emphasis is on quality of movement, rather than quantity, which makes one feel invigorated, rather than depleted after a session. Pilates is perfect for any age, body type or fitness level. Yoga's history has many places of obscurity and uncertainty due to it's oral transmission of sacred texts and the secretive nature of it's teachings. It's roots can be traced back to 5,000 years ago, although some researchers think Yoga may be up to 10,000 years old. The Classical period of Yoga is defined by Patanjali's Yoga Sutras, the first systematic presentation of Yoga. Written sometime in the second century this these texts describe the path of Raja Yoga, often called 'classical Yoga'. Patanjali organized the practice of Yoga into an eight limbed path, containing the steps and stages towards obtaining Samadhi or enlightenment. Patanjali is often considered the father of Yoga and his Yoga Sutras still strongly influence most styles of modern Yoga. Training with the TRX, you'll experience the physical benefits of improved mobility and flexibility, more lean muscle mass, and functional strength. Because the TRX Suspension Trainer requires you to engage your core with every exercise, you get a total-body workout every time you train. Yoga in the comfort of your home, or at a private yoga space. Each session is 60 minutes, and it is tailored to the needs, level and wants of each individual. Pilates is a strengthening yet extremely therapeutic method, suitable for all levels, and a perfect way to still move when recovering from an injury or surgery. I offer Pilates mat in the comfort of your own home or a private Pilates studio. 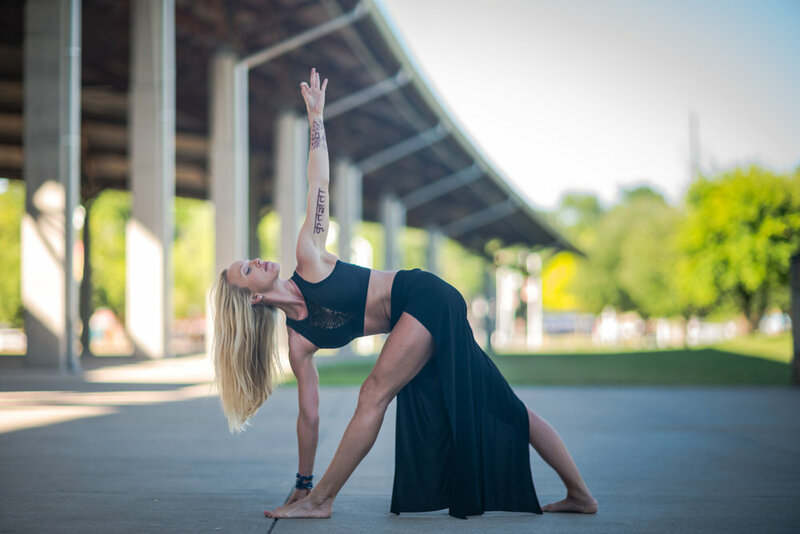 Private Pilates equipment sessions are offered at ALIGN Austin, located on Lake Austin Blvd. and Mopac.